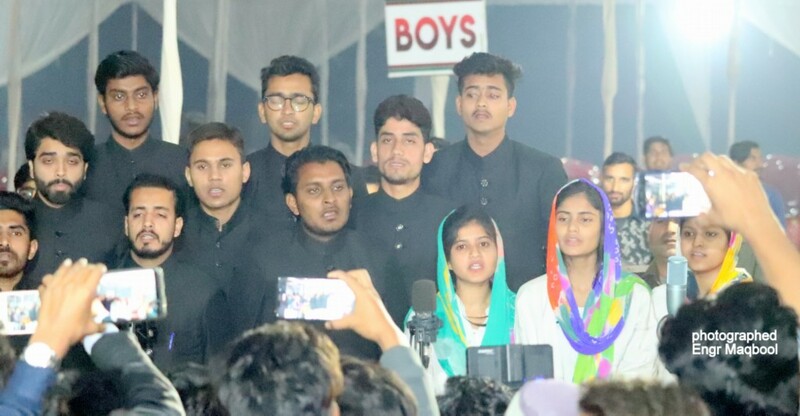 AMU Students Union results were declared early in the morning of of 4th November 2018.The winning candidates were eagerly waiting for installation Ceremony.Their wings were ready to fly in much awaited dream land ,the Union Hall. 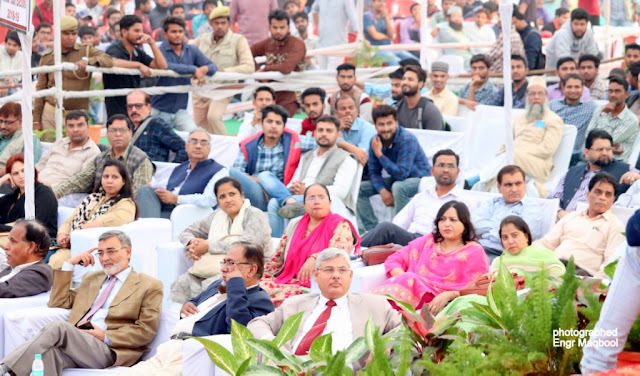 12 November was the date fixed for Installation Ceremony.This function held in Athletic ground of AMU Aligarh in a huge pandal. Previously it was announced to be held in Kennedy Auditorium, but in a very short notice the venue was changed. Installation ceremony of Union 2018 was presided by Aligarh Muslim University, Vice Chancellor Prof Tariq Mansoor. Professor Zaheeru-d-din (Chief Election Officer) and Professor Nafees Ahmad (Hon. Secretory of Students Union) was also present. The programme was conducted by Dr Shariq Aqil. 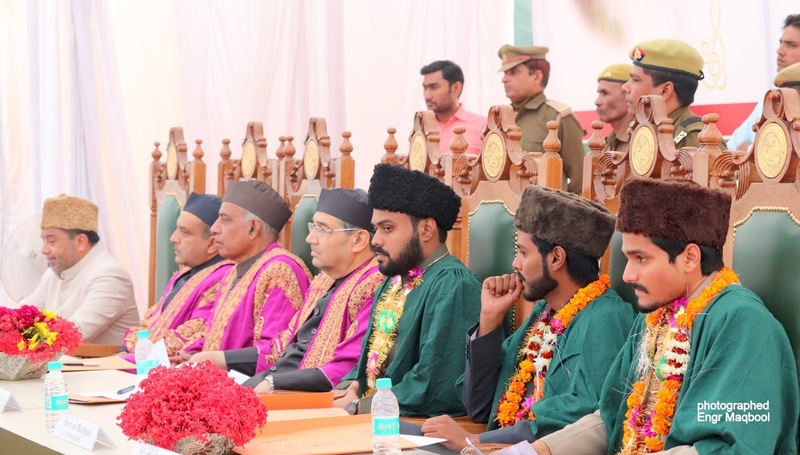 Maryam Batool, Ferdaus Ahmed Barbhuiya, Syed Shahrukh Hussain, Gawtham K, Nishant Bhardwaj, Naved Alam, Fahd Ayub Zinjani, Moin Uddin, Fakhara Khan and Hasan Mustafa took charge in the installation ceremony presided by Aligarh Muslim University (AMU) Vice Chancellor Prof Tariq Mansoor. 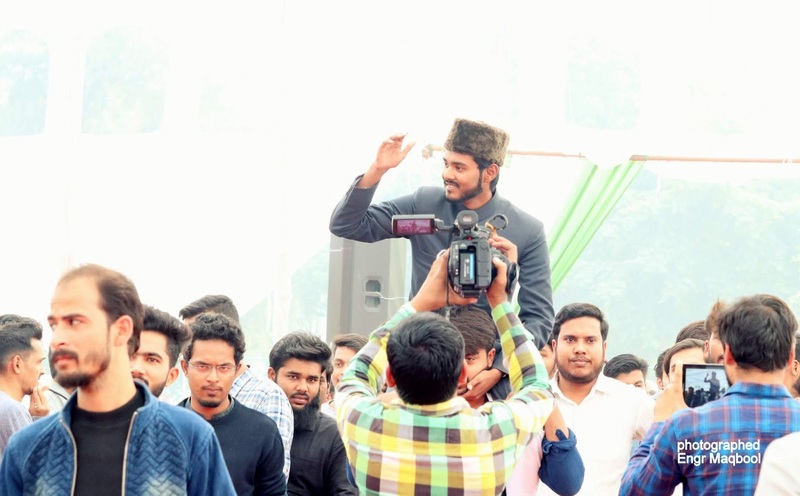 It is special to mention that: Salman Imtiaz new elected President of Aligarh Muslim University Students’ Union hails from Aligarh and is a student of Ph.D. (JRF Qualified) Social Work. It is after 44 years that someone from Aligarh has been elected as president. Dr Shariq Aqil started installation ceremony by calling one by one the name of 10 winning Cabinet members to take their seats, It first started by Senior Cabinet Syed Shahrukh Hussain ,followed by other cabinet members.After it Huzaifa Amir (Hon) Secretary, Hamza Sufiyan (Vice President) and last name called was Mohammad Salman Imtiyaz (President). 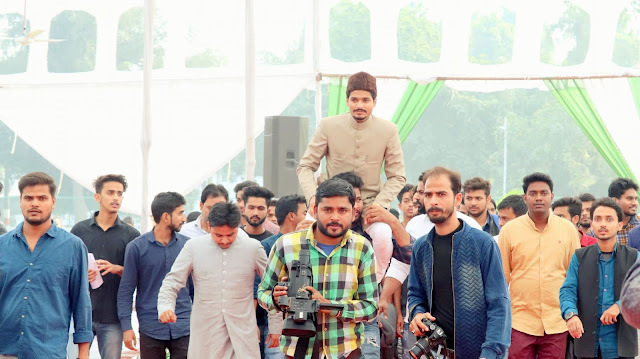 The entry of three chair persons of AMU Students union,Secretary,Vice President and President in installation place always remain as a “Hero’s Entry”:They use to enter sitting over shoulders of their supporters ,in a gracefull style waiving hand in “Salam” ,style. 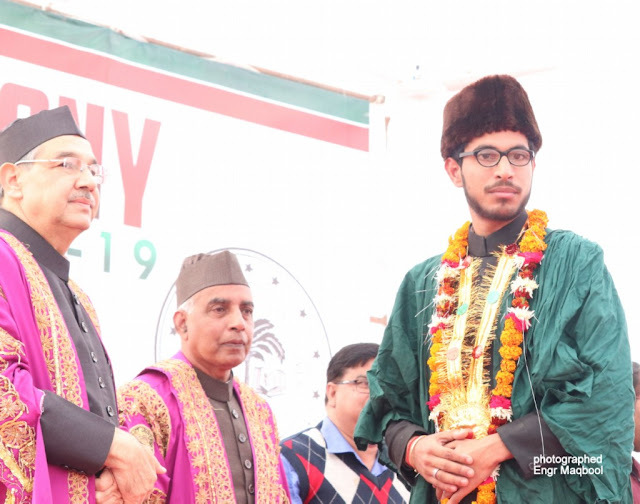 Vice Chancellor Dr. Tariq Mansoor honored them with garlands and offered the traditional gown to wear.As per tradition of AMU Students Union ,the defeated chair candidates were called first to share their “Man ki baat” with audience and management. 2018, two groups were clashed. Zaid Sherwani’s (defeated candidate) lukewarm speech was being held at the post of Vice President. In his speech, he was telling himself innocence by mentioning the riot and controversy that happened with the doctors of JN Medical College. Meanwhile, a ruckus started in the back of the students audience gallery. Even before people understand something, they got clashed between two factions. Chairs started moving on each other. The situation of rumors and panic emerged in Pandal. Angry Vice Chancellor Prof. Tariq Mansoor left the stage and moved back to the green room behind. A young man was injured due to the chair.He was sent to J.N Medical College for treatment. Some senior students and members of the proctorial team sitting in the pandals started intervening. 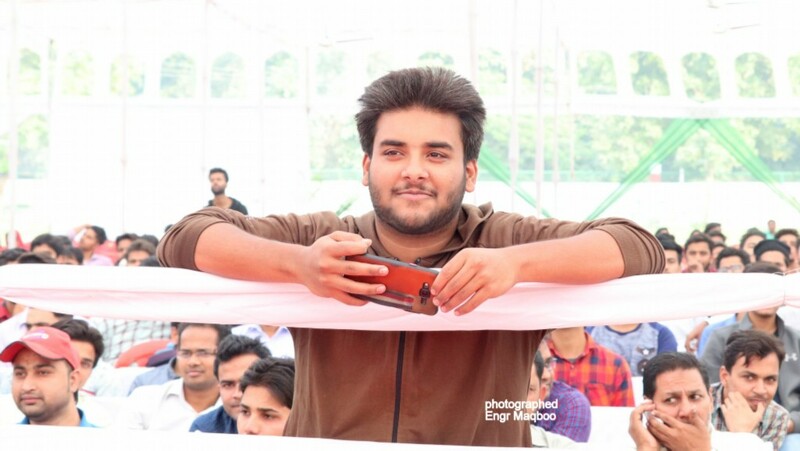 Sonaveer Singh, the defeated candidate was summoned as vice-president when the atmosphere was peaceful. Once they started speaking, a ruckus started again. Stopping Sonveer's speech, the student union's newly elected president Salman Imtiaz and student leader Alauddin reached the mic, and appealed to students to maintain peace. Speaker Salman Imtiaz explained to the students that some people want to disturb the program. Action must be taken against them. Trying to defame the Union. Those who have tried to interrupt the program will see them later. 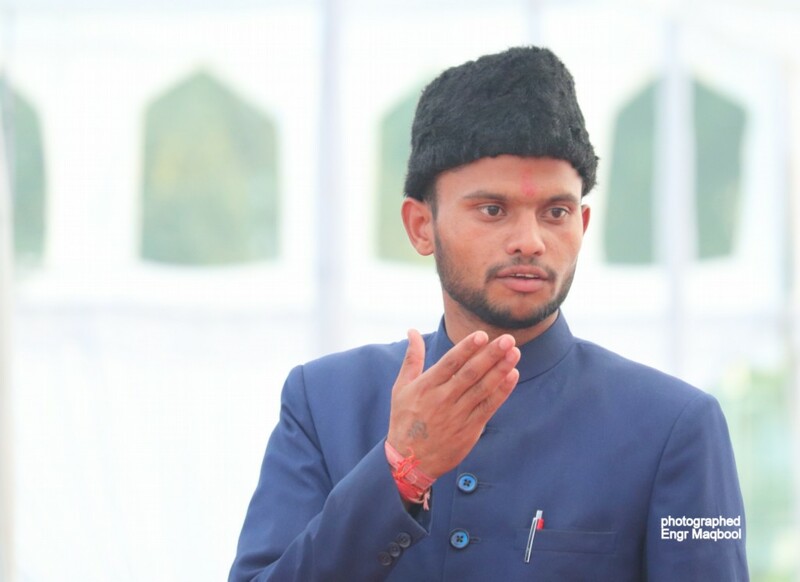 After the atmosphere was restored in Pandal Sonveer Singh and then Yasin Ghazi was invited for the speech. Yasin Ghazi says that until the Vice Chancellor does not come, the students will not be addressed. After that the Vice Chancellor was called on the stage. 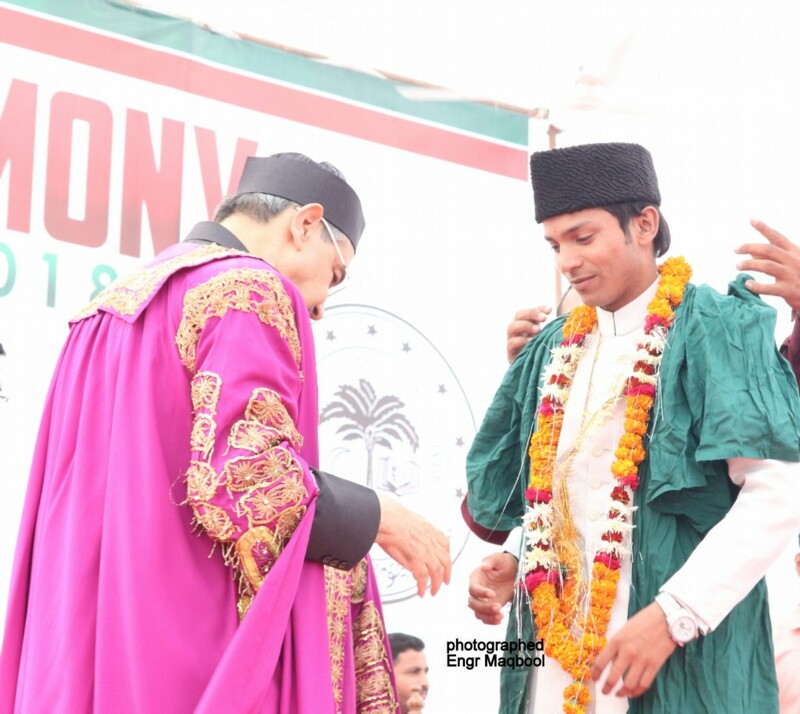 Seeing the look of the installation ceremony it became clear that the time to come is not easy for the union. All the defeated student leaders were united looking against the newly elected office-bearers and cabinet members of the union. 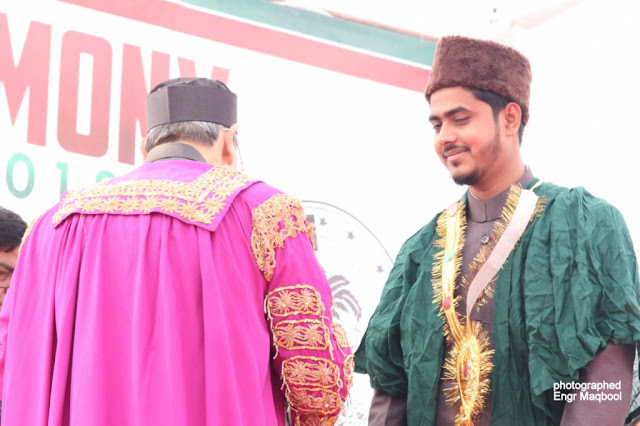 It was also a matter of fact that the student leaders, protesting against the newly elected union, accused former MLA Haji Zamirullah, for casting President Salman Imtiaz to contest elections and made it clear that if the President invited someone in the campus then he would not tolerate. However, later, President Salman Imtiaz gave a reprieve to the opposition student leaders. Showing photos of Alauddin on mobile, he said that these people welcome Haji zamirullah and ask for money. I'll open all poles later. He dismissed the allegations made by anti-student leaders in the end. After speeches by defeating chair persons, the winning chair persons were called to address the gathering. 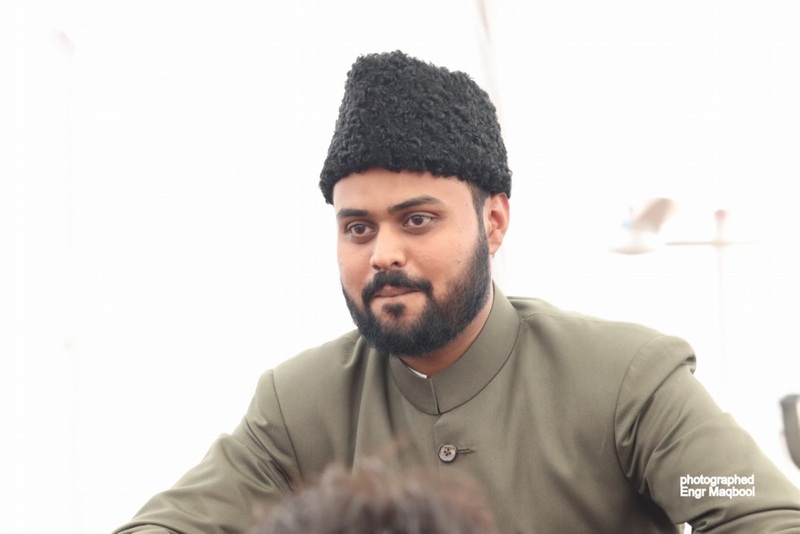 (1) Secretary Huzaifa Aamir: Said that those who used to be grateful to the British now question over our patriotism and faithfulness towards country. Trying to erase us by changing the names of the cities . 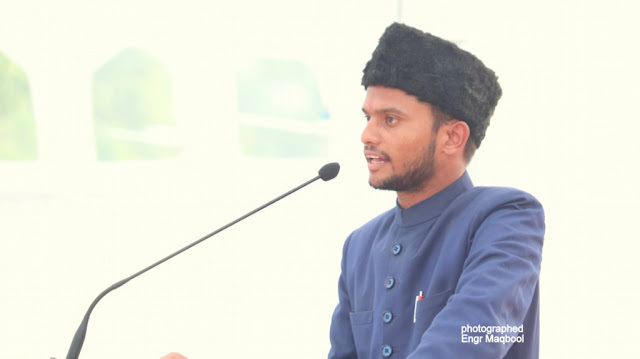 He appealed to the students to write on social media who gave the country Taj Mahal and Qutub Minar.He attacked govt ,whether the place from where you deliver speech belongs to your fore fathers. Ask the Muslims, who understand the two-city urban areas, from where they work, did he bring his father-in-law? In 1857 we had exhibited corpses and asked us today what we gave to country. Aamir said that for the last 70 years, there are two parties in the country. A Hard Hindu and the Second Soft Hindus. One attacks from front, second attacks from rear. Uses religion to hide its shortcomings. 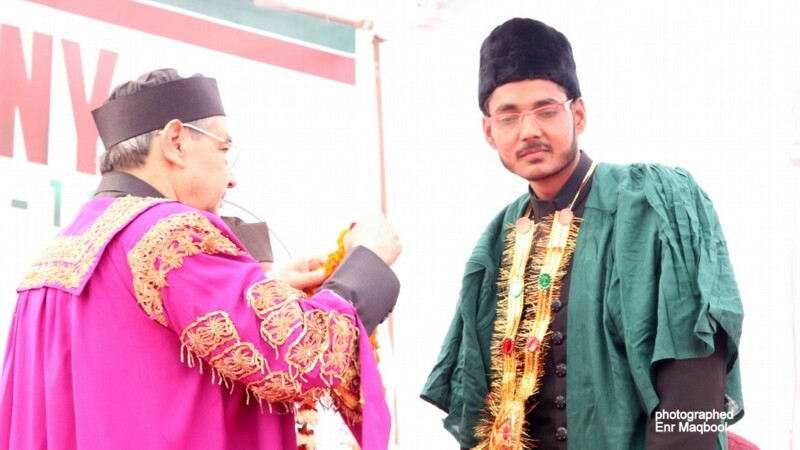 During his address, Huzaifa Amir strongly attacked the Vice-Chancellor sitting on the platform. On the charge of moving back and forth against the district administration, the V C became angry and in the middle, struck Amir and said that you are lying. 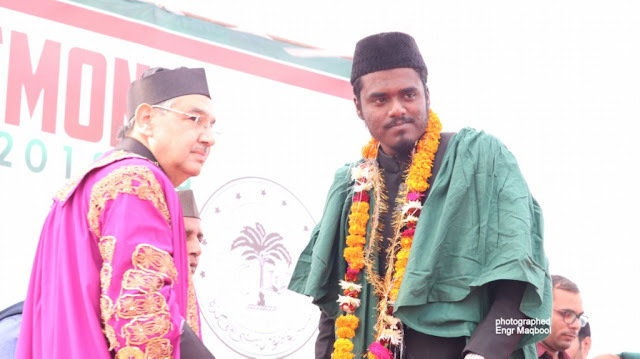 Aamir also attacked the Vice-Chancellor on the grounds of land, appointment, enrollment and nomination etc. His hard speech was unbearable to university management, they took it bad. (2)Vice President Hamza Sufiyan: said that efforts are being made to eradicate the names of Muslim cities. In such a situation, the war is raging. He said that he is not against any Hindi or Sanskrit. But if Urdu will not be talk in AMU, then what will be the point in B H U? The former Vice Chancellor wrote the sign boards of the campus in Hindi. Such mistakes should be corrected. 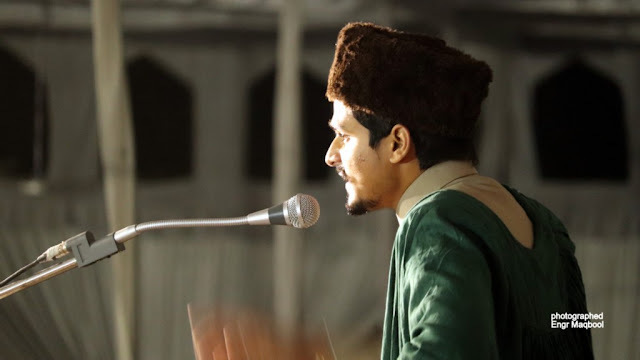 If there is no justice with the Urdu in AMU, then where will it be? He said that the falling Waqar of AMU should be saved and it should be brought to power. Whoever tries to overturn A M U's brothers, I will be tough against them. It is noteworthy that the anti-student leaders had alleged that they used stringent words with Vice President Hamza Sufiyan along with the students sitting on the Baba-e-Syed. 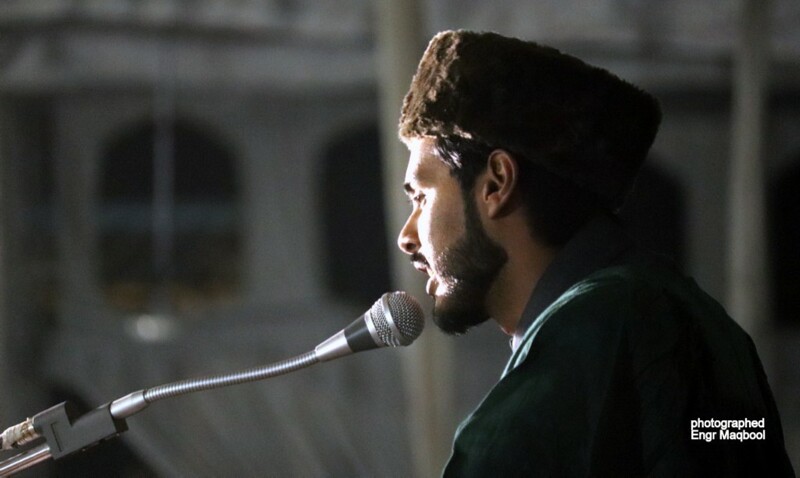 (3)Mohammad Salman Imtiaz, President: Said that we are Indian Muslims. Nobody has the right to question our patriotism. We will not even give proof to anyone. We showed our intention only at the time of partition. Salman Imtiaz said that he would create a legal network. For this, law experts , like Ram jethmalani, M Katju and Faizan Mustafa assured their help. They have started the conversation. Together with them we will fight for the right. They will create a media network like Oxford, so that the matter of Union and AMU can be made globally. During his address, he raised problems related to AMU students and gave assurances to resolve it. He also took strong exception to the anti-student leaders and said that he has a childhood relationship with son of Haji Zamirullah Khan. The union has not started working yet and people are accusing them of selling. The roots of the lobbying are thrown out, they are not being tolerated. My wife is questioned that I have contested for her appointment in the university. For this, experts from law like Ram jethmalani, M Katju and Faizan Mustafa will get help. They have started the conversation. Together with them we will fight for the right. 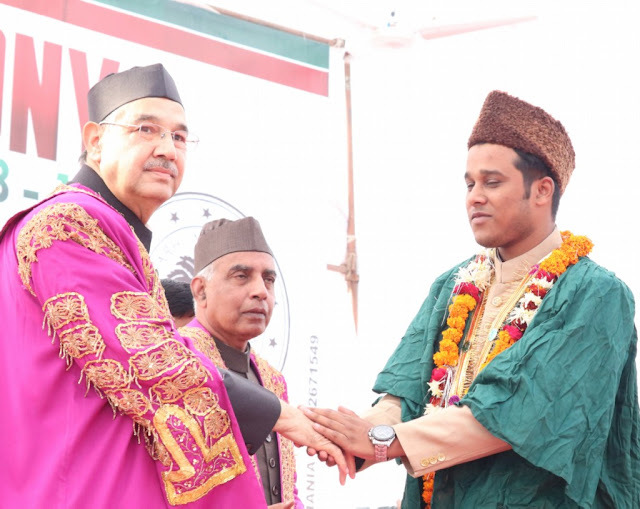 They will create a media network like Oxford, so that the matter of Union and AMU can be made globally. During his address, he raised problems related to AMU students and gave assurances to resolve it. The accusers do brokerage and sell Shervani. Everyone knows who has cut off on Union Hall. He said that the people of the bargain will sherwani take off and returning to the union's work and returning the voice. Will open all the gates from tomorrow many doctors of J N Medical College practice private practice. Will not spare them. 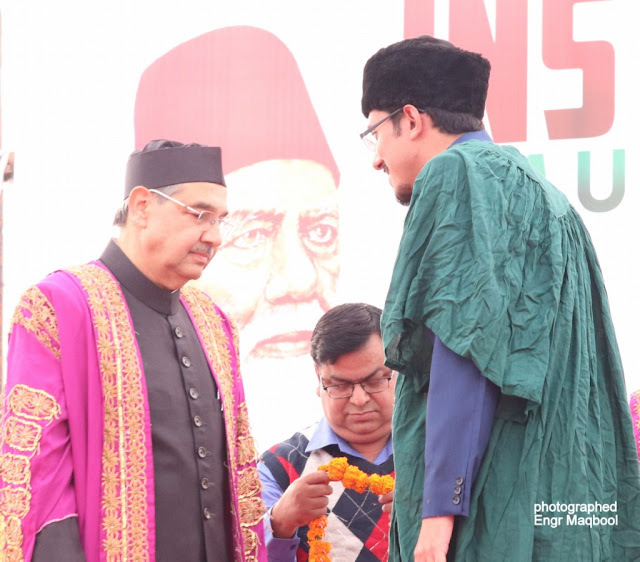 Here,the Installation ceremony of AMU Students Union 2018 ended.Vice Chancellor Prof Tariq Mansoor announced that the classes of University and Schools will remain suspended on November 13’ 2018. 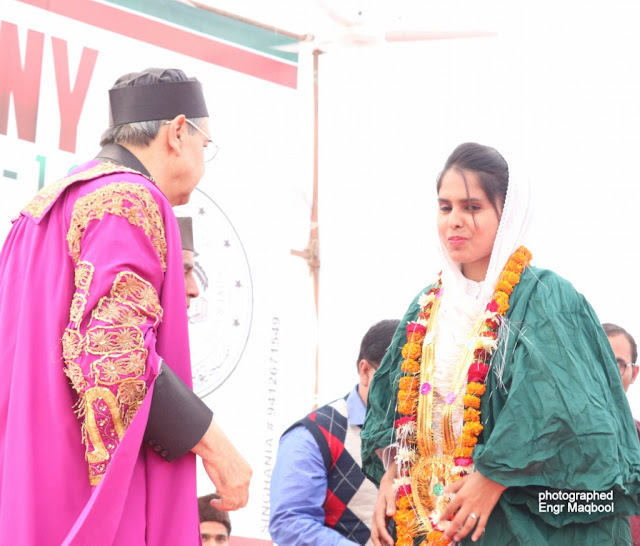 The ceremony ended with University Tarana and National Anthem. 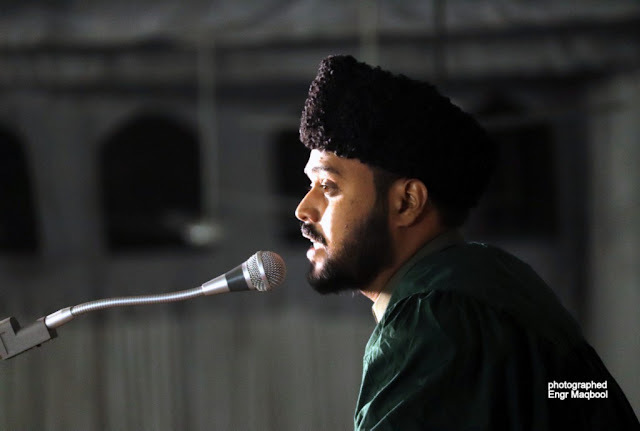 Dr Shariq Aqil asked the newly formed cabinet “first to go to AMU’S grand Masjid for two rekat namaz-e shukrana and offer fateha to Sir Syed Ahmad Khan”,the founder of AMU. 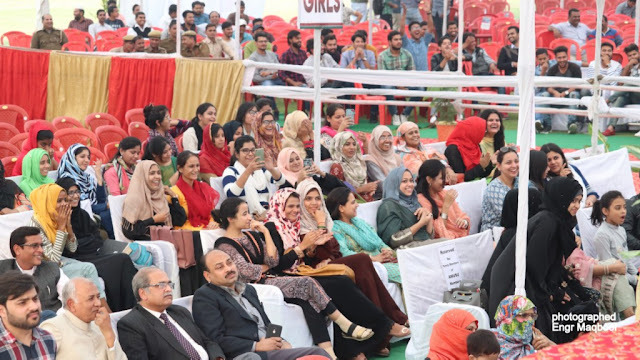 Aligarh. 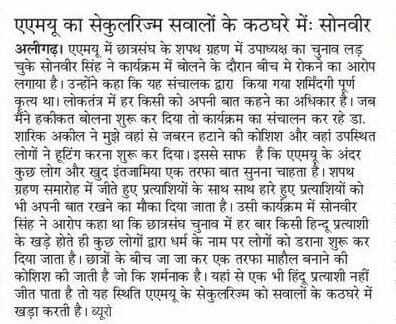 Here I am sharing a post published in Hindi Daily News Paper Amar Ujala ,in which Sri Sonveer Singh,the defeated Vice Presidential candidate.He has raised question over “Secularism in AMU Aligarh”. 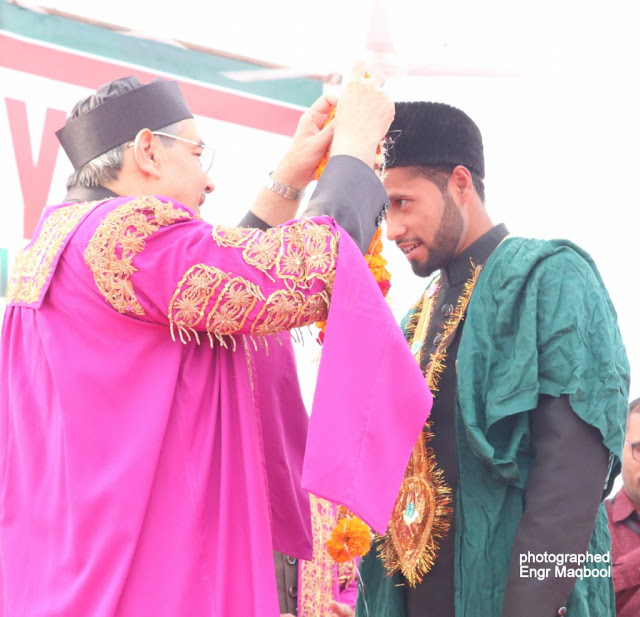 Here I am ending this blog: “Installation Ceremony of AMU Students Union 2018: In Lense Of Engr Maqbool Akram”. Written ,photographed and posted by Engr Maqbool Akram.